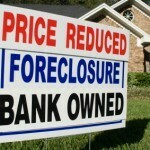 A sizeable chunk of my legal career has been spent neck-deep in the morass of the foreclosure wave that has wreaked havoc across the land several years ago. If you wonder what has made me cynical about both the economy and the competency of government, it was my year doing foreclosures. First of all, I am not the big expert, and this is in no way legal advice; I worked long enough to learn how the process works and how it ties in to real estate market and the economy as a whole. I think I have put the picture together reasonably well, and I have learned a few things about our national obsession with real estate. Around the corner from my former apartment in Newton was a house that was taken in foreclosure. The â€œFor Saleâ€ sign had been there for a very long time, the lawn wasnâ€™t mowed regularly and the shrubs had died in the winter but hadnâ€™t been removed. Walk around your own neighborhood and see how many houses are for sale. Sometimes the sign openly states that it is bank-owned, other times you might have to search on the county assessors website. There are plenty of bank-owned houses in Iowa; there are many, many more in California, Nevada, Michigan and Illinois.